Violent upheaval in the Middle East has recently spawned all manner of maps purporting to explain how the region got this way. Here, instead, are 15 maps that don’t claim as much. Or rather, they do not seek, like many other maps, to capture some fixed set of core facts about the region. Instead, these maps provide a more fluid perspective on the Middle East, often by showing what didn’t happen as opposed to what did. But for all these maps don’t show, they do illustrate one thing: the sobering fact that no one map—or even set of maps—can ever explain the region’s complex history and politics. Rudyard Kipling once wrote that “East is East, and West is West, and never the twain shall meet.” But when you try to map where exactly they diverge, the border appears to be constantly on the move. The ancient Greeks drew the West-East distinction between themselves and the Persians along a shifting line somewhere between the Aegean Sea and the middle of the Anatolian peninsula, which roughly corresponds to modern-day Turkey. As Islam spread in the seventh century, many Europeans imagined the corresponding division between civilizations running between the Islamic world and “Christiandom.” Later, prior to World War I, Europeans’ conception of East began at the borders of the Ottoman Empire. This all changed suddenly with the advent of the Cold War, when a new border between the communist East and capitalist West appeared. If there has been a constant feature of the division between East and West over the centuries, it’s our eagerness to draw a line between them. At a time when the Crusades still serve as the historical starting point for many discussions of the modern Middle East, this map offers perspective on how these messy medieval wars became a go-to metaphor for Christian-Muslim conflict. Shown here are the geographic origins of the Normans and Seljuks, peoples who emerged from Scandinavia and the Central Asian steppe to conquer the Christian and Muslim worlds, respectively, before coming into conflict with one another during the Crusades. In light of their remote origins, the Normans and Seljuks were originally considered uncivilized barbarians by members of the civilizations they ultimately conquered. Both groups zealously embraced their new subjects’ religions to compensate. Thus, when the Normans and Seljuks faced off in the 11th century, the rhetoric of religious war helped each side prove its piety. That same rhetoric performs a similar function today. The pursuit of power drove plenty of violence between Muslims and Christians during the Crusades, but it also fostered cross-cultural cooperation. One of the most striking examples is this 12th-century map, made by an Arab geographer for a crusader king. After the Normans conquered Sicily from the Muslim Saracens, King Roger II turned to cartography to bolster his rule, hiring the famous Arab mapmaker Muhammad al-Idrisi to depict the known world for him. The resulting work is known as the “Tabula Rogeriana” in Latin and the “Kitab Rujar” in Arabic (or by its full title, the “book of pleasant journeys into faraway lands”). The map drew on classical Greek sources but was oriented, like most maps from the Arab and Muslim Mediterranean, with south on top. That’s the Nile Delta at the top, the Persian Gulf on the top left, Greece on the bottom right, and Cyprus, Crete, and the Aegean Islands in the middle. The orange and purple bits that resemble chicken feet are mountains, and the squiggly green lines rivers. Many people wonder what might have happened in Palestine if, after the disappearance of the Ottoman Empire after World War I, the British had never colonized it. In all likelihood, the French would have colonized it instead. More broadly, if the French and British had not divided up the Middle East between them, the Germans would have been perfectly happy to colonize the region, perhaps after winning World War I. This map shows a German imperialist fantasy from the end of the 19th century. It appeared as part of an 1897 work by Adolf Guyer-Zeller, a Swiss railroad magnate. In these maps, Guyer-Zeller seems keenly interested in the potential for imperial Germany to create rail routes—not just the famous Berlin-Baghdad railway the Germans began building in 1903, but also links from Aleppo to Moscow and another route east into India. “Deutsch” Arabia certainly would have turned out differently than the British- or French-run Middle East, but it’s unlikely the inhabitants would have been any happier with the arrangement in the long run. It’s easy to say that the borders of the modern Middle East ignore the region’s ethnic divisions, but it’s harder to tell what those ethnic divisions are. Many contemporary maps show clear lines between Arabs and Kurds or Sunnis and Shiites, but what about maps from a hundred years ago? 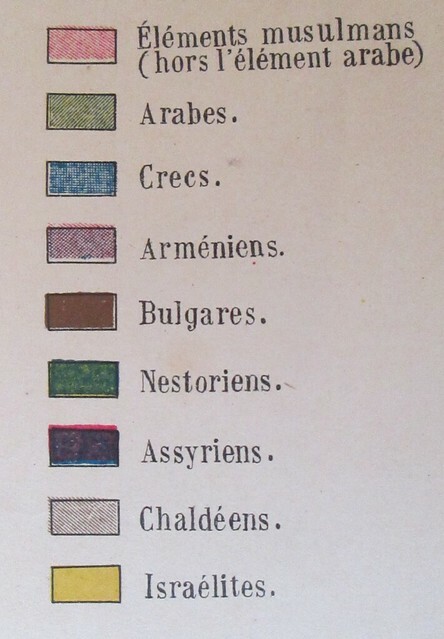 Here’s one drawn by the Ottoman government during World War I with some pretty unfamiliar categories. Most strikingly, it divides the Mediterranean coast between settled “Syrians” (the red horizontal lines) and nomadic Arabs (purple vertical lines). The map similarly divides the region’s Turkish-speaking residents between settled “Turks” (red vertical lines) and nomadic “Turkmen” (green checks). Rival powers contested the oil-rich region around the city of Mosul long before Sunni militants wrested it from Iraq’s control this summer. After World War I, Turkish nationalists drew this ethnographic map to advance their claim to the former Ottoman province. The legend cleverly divides the province’s population into “Arabs” and “Non-Arab Muslim Elements,” thereby dodging the inconvenient distinction between Turks and Kurds without quite claiming that they’re the same. Today, the Kurdistan Regional Government controls much of the former Mosul province, while the Islamic State of Iraq and Syria occupies the city itself. And in Turkey, the question of how to reconcile Kurdish ethnicity and Turkish citizenship remains a hotly contested one. The map is just one example of the creative cartography mapmakers have often used when given the impossible task of drawing clear national borders over complicated demographic realities in the Middle East. This map celebrated King Faisal’s declaration of a short-lived Arab kingdom in Damascus in 1920. Faisal, famous for his role in the Arab Revolt with T.E. Lawrence, lost his Syrian kingdom to the French army, at which point he became king of British-ruled Iraq as something of a consolation. This map offers a tempting vision of a united Middle East that could have arisen under Faisal in the absence of European colonialism. But in delineating the borders of Faisal’s kingdom (the dotted lines), this map also highlights some of the inevitable problems with that vision. For one thing, Turkey, which as the Ottoman Empire’s successor state only grudgingly gave up Mosul province to the British after World War I, would not have parted peacefully with the territory Faisal claimed for the Arabs. The Maronite Christians of Mount Lebanon also had mixed feelings about being included in a Muslim kingdom, not to mention the Zionists who had already settled in Palestine. What’s more, members of Faisal’s family, the Hashemites, proved to be unpopular with many of the actual Middle Easterners they ruled. Within a decade after World War I, the Hashemites were driven from their original territory in Mecca by the Saudis, and after World War II Faisal’s heirs, who had assumed the leadership of Iraq, were deposed by a popular military coup. The period of upheaval following the collapse of the Ottoman Empire produced a number of novel ideas for new states. Some of these, like the New Assyria (1916), moved from the imagination to the drawing board, and then no further. First published in an Assyrian nationalist newspaper, this map represents the rather ambitious vision, held by members of the Chaldean, Nestorian, and Süryani minorities in the Middle East, for embracing a common identity based on religious similarities and shared history as the basis for their own politically sovereign territory. Other proposals, like this map of Palestine (1917), did become a reality, albeit in somewhat altered form. In the article that accompanied the publication of this map, the Russian-born Zionist Isaac Don Levine advocated the creation of a Jewish state called Palestine whose borders would encompass Gaza, the West Bank, and southern Lebanon. Levine credited centuries of Christian oppression for the endurance of Jewish identity, highlighted Jewish financial support for George Washington and the American Revolution, and then concluded that with the Russian revolution and overthrow of the tsar, anti-Semitism was “on the decline.” Thus, a Jewish state was needed purely as a matter of national self-determination. The British are often accused of cynically creating Iraq as an artificial, unworkable state by joining territory inhabited by Shiites, Sunnis, and Kurds. In Syria, the French once faced the opposite charge. As we now discuss the possibility of Syria collapsing into smaller ethnic enclaves, it is worth remembering that the French originally proposed a similar division. Hoping to preempt the emergence of Arab nationalism through their own cynical policy of divide and rule, the French, as this map from 1922 shows, planned to break what is now Syria into Alawite and Druze mini-states alongside separate, largely Sunni, territories in the country’s north and south that would be governed from Aleppo and Damascus. They eventually abandoned the idea in the face of protests from local Arab nationalists who demanded a larger, multi-ethnic state. In the 1930s, French colonial authorities came up with their own ethnographic mapping of the Eastern Mediterranean coast. Some of the categories in this map are the same ones the Ottomans used, while others, such as Yezidis and Circassians, are different. But what stands out is that, in keeping with the French policy of divide and rule, one group is noticeably absent from the 18 religious and ethnic groups included in the key: Arabs. Taking a detour from war and conflict, this map shows where foods known in the U.S. as “Mediterranean” or “Middle Eastern” are most commonly found. These foods can cross religious, national, and linguistic boundaries even while they also define unique culinary, cultural, and geographic regions. The practice of drinking strong coffee in small cups with grounds, for example, reaches from the Balkans all the way to North Africa. Hummus, though, is relatively rare in Greece and Turkey. Like falafel, the dish spreads north to a limit that is, I can only assume coincidentally, coterminous with that of the Arabic language. Distilled liquor flavored with anise is consumed under a variety of names—ouzo, raki, arak—across the region. In the Balkans, however, “raki” refers to a different, more popular drink that more closely resembles grappa—or maybe paint thinner. Sometimes, culinary culture defies political borders; other times, it conforms to them. In the Turkish city of Izmir, you can eat grilled octopus that tastes identical to the octopus you’d find on the nearby Greek island of Chios. But in Izmir you can also find a range of dishes like lahmacun and cig kofte that are almost completely unknown in Greece. These foods were brought to Izmir from southeastern Turkey by domestic migrants. “Middle East” is a Western term reflecting a Western perspective—India’s first prime minister, Jawaharlal Nehru, once observed that the region should really be called West Asia. Middle Easterners employed similar terminology based on their own perspective—hence Arabic words like Maghreb, meaning “West” and referring to the part of North Africa located to the west of most Arabic-speakers. Over the past century, English terminology for the region has changed along with the geopolitical interests of British and American policymakers. In the 19th century, the British conceptually divided up what most of the world now considers the Middle East into the Near East (meaning the Balkans and the Eastern Mediterranean) and the Middle East (the region around Iran and the Persian Gulf, crucial for the defense of British-ruled India). The collapse of the Ottoman Empire after World War I made it easier for Europeans to consider as Western a large part of the former Near East, including the Balkans and sometimes Anatolia. It also brought much of the rest of the Near East under the same colonial authorities—the British—who were responsible for the Middle East. As a result, the term “Middle East” began to apply to colonies such as Palestine that were once considered in the Near East. Americans embraced this new usage of “Middle East” during World War II, and ran with it as the U.S. became politically involved in the region during the Cold War. More recently, with the end of the Soviet Union, the term Middle East has again expanded in American usage to encompass Afghanistan, Pakistan, and Central Asian countries, as those places seemed to slide into a kind of Islamically themed, strategically relevant chaos. 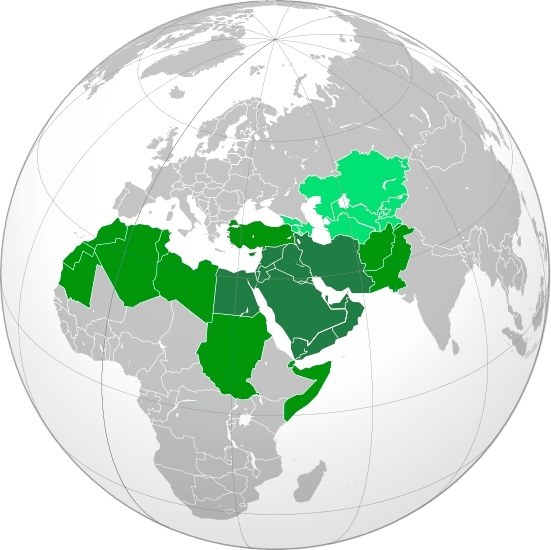 Nowadays, the U.S. media seem to have arrived at a somewhat clear, if not always coherent, consensus roughly based on a tiered understanding of what is definitely the Middle East (dark green in the map above), more or less the Middle East (green) and maybe the Middle East (pale green). This is a map I designed to appeal to the enthusiasm U.S. policymakers and Internet map lovers share for radically simplified visions of the world. The map reduces every complex bilateral relationship between the U.S. and a Middle Eastern country to With Us (blue) or Against Us (red), in the dichotomy popular during the Cold War and the War on Terror. The symbols indicate why countries have switched categories over the years. These include the gun (military coup), the tank (invasion), the check mark (election), the pen (treaty), and the guy with a flag (popular uprising). Caveats about oversimplification aside, there does seem to be something of a pattern in which democratic elections move countries from blue to red, and then coups quickly turn them blue again. At their best, maps can clarify complicated global dynamics by making them appear simple. So perhaps there is something perverse in using cartography for the opposite purpose: to make the world appear even more convoluted than we think it is. But if these maps serve as a reminder of the many things that individual maps can’t quite capture, that’s all the more reason to study them well. Nick Danforth writes about Middle Eastern history, politics, and maps at The Afternoon Map.